I'm really happy with the way it turned out. :D It looks even better than I expected! Colouring was easy :hmpf:, but making the outlines not that much. I just used two different scans (cover of chapter 21 and this one with Yuki and Zero ). This is a corrected version now, added some textures and brushes to make it look better. I think now is good. I also removed the string Yuki was holding and put a fan into her hands. I removed the red moon and put a normal one, since I didn't like it there too. And to end I even added blood to Zero. It's up to you to judge if its better. Wow! I simply adore this wallpaper! They're both vectored very well and the bg just suits the atmosphere! Is the moon red for to describe the night of the vampires or something like that? Wow! Very great idea! I like it! Good job! 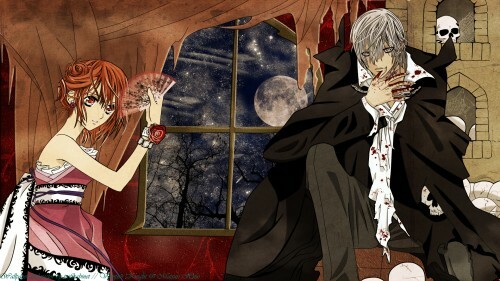 Nice wallpaper of Vampire Knight! But...its still an awesome wall. +fav. but still, Yuki looks great! Nice job. This really is a lot of great work ! I do like the background and I love how you vectored Yuki. Yet, there's something strange with Zero's eyes, I think. Overall, it's a really gorgeous work. thank u for this amazing wall! Quote by KriisEHWow! I simply adore this wallpaper!